Cementing its presence on Collingwood’s Smith Street as the Thai gastrobar to be reckoned with, Chalawan is celebrating the change of season with four new cocktails on the “Croctail” menu. Expertly created by head bar tender Nawin Pimolrat the contemporary and creative new “Croctails” have an extra bite fusing Western and exotic Eastern flavours. Pull up a seat, relax and be taken straight to the cinema with the Chalawan Theatre, (pictured left) boasting house made lamington syrup shaken with honey butter cachaca, rumchata, pineapple and Liquid smoke. 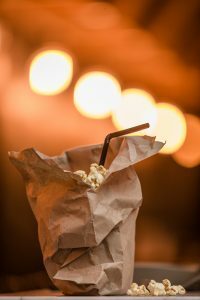 This uniquely creative cocktail is served in a paper bag and topped with sweet and salty popcorn so punters can snack and sip simultaneously. Let your senses explore the Holy Tumbler and watch the Absinthe flames rise, and draw in the scent of flambéed rosemary. Featuring Pisco Control, Licor 43, Absinthe, celery bitters, house made ginger sugar and fresh lemon juice this fragrant cocktail is topped with rosemary and lychee. Be tempted by the smoky and spicy yet sweet scents of Bangkok street food with the Bangcaux Swizzle. 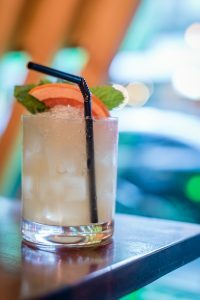 The contrasting flavours of Cuban aged rum (Santiago), spiced rum, old spiced rum, grape fruit juice, grapefruit bitters, Capi cola, fresh lime juice topped with candied ginger are reflective of its namesake city. Experience fresh forces of motion when ordering Newton’s Smash (pictured right). Featuring three simple ingredients of Bombay Gin, vanilla syrup and lemon bitters. The perfectly paired trio will have punters feeling those fresh spring vibes of sipping cocktails on a sunny Sunday afternoon. Chalawan are now also offering an exquisite three-course banquet menu featuring a selection of their most popular dishes and the Dear Jasmine cocktail for $68 for groups of four or more. Step into the crocodile kings jaw on Smith Street this spring for a journey for your taste buds straight to the hustling, bustling streets of Bangkok.